Your Challenge: Limit your organization’s liability for supervisor and employee words and actions, without the cost and time commitment of standard training programs. BLR’s Solution: The soup-to-nuts kit that provides everything you need to deliver fast employment law training classes -- without pulling your key contributors away from core responsibilities. 10 Minute HR Trainer is the busy HR manager’s dream tool: everything needed to conduct fast and memorable training on key employment law topics. And by fast, we mean 10 minute courses that deliver those vital how-to (and definitely-do-not-do) instructions your managers need to avoid a catastrophe the next time they have to hire, fire, discipline, investigate a complaint, and otherwise interact with employees. You may not be able to pull supervisors out of circulation for a day-long employment law workshop, but you can probably find 10 minutes every two weeks. 10 Minute HR Trainer is your perfect turn-key companion for making it work. Do your supervisors have the skills and training to handle complex HR legal issues in their everyday dealings with employees? If not, an inadvertent mistake on hiring, termination, interviewing, FMLA, sexual harassment, or the Americans with Disabilities Act could turn into an embarrassing, expensive legal nightmare. 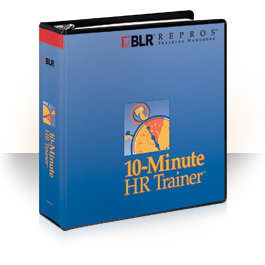 BLR’s 10-Minute HR Trainer™ is the easy way to deliver valuable human resource management training meetings in as little as 10 minutes. It includes everything you need for training- meeting outlines, handouts, quizzes, etc. Put it to work in your organization and stop worrying! Everything you need to instantly train supervisors on essential HR skills. Supervisors get hands-on experience from actual HR situations. Stay updated with the latest in training news, techniques, and tips to help you conduct effective and interesting training on the most critical training topics. Be confident your training message is always up to date. Plus, new HR training sessions and employee handouts to keep training fresh. GUARANTEE: Your 100% satisfaction is guaranteed. If for any reason you are not completely satisfied with 10-Minute HR Trainer, simply let us know within 90 days, and we will issue you a complete refund.